I’m grabbing every moment of calm before the rush of autumn. We’ve brought two favorite friends to a little house two steps from the dunes in Dewey Beach, Delaware . We’re reading, napping, walking, sunning and eating and it’s a sensational way to celebrate the last glow of summer. I am not sure why there was a sudden and urgent call for nachos, but there it was. I’ll admit… I loved being able to fulfill those plaintive cries. With just a few pantry items I had stuffed into the car, we had some awesome snacks. They’re not official nachos (whatever that is), I only had borlotti beans, I couldn’t find a grater, I wished for roasted corn or chorizo. It can always be more perfect, but here’s the thing… the entire pan was scarfed up. Go old school for Labor Day. Heat up some nachos. Serve with Coronas and Tequila. Have a great holiday weekend, friends. Heat the oil in a sturdy skillet until shimmering. Add the onion and cook until translucent. Add the garlic and cook another minute or two just until you can smell the garlic, but have not burned it. Add the beans and cook through, smashing some of them with a fork to make the beans creamy and saucy. Cook until heated through, about 6 minutes. 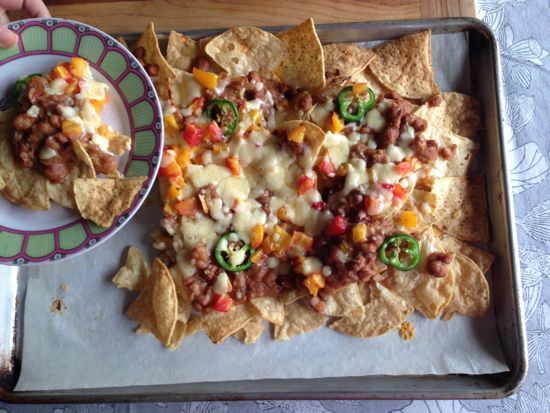 Spread out the bag of corn chips on a baking sheet. You can line it with parchment for easy clean up, or not. Whatev. 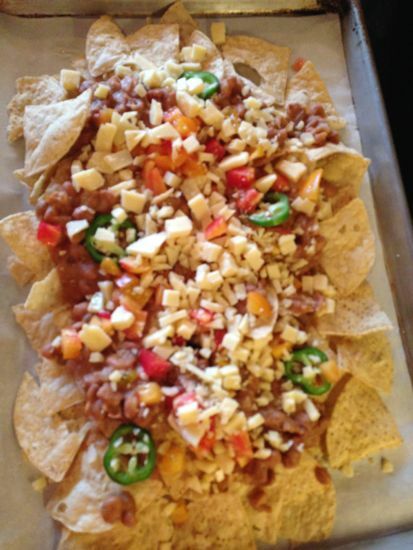 Evenly scatter the tomatoes, beans, jalapeno slices and cheese over the chips. Pop in the oven until bubbly and cheesy and hot and crisp, about 16 minutes. If you have carried these things to the beach house, you might serve the nachos with roasted poblano salsa, pickled red onions and sliced avocados. If you didn’t, the nachos will still be awesome.